13 August 1918: The United States Marine Corps allowed women to enlist so that they could fill clerical roles stateside and more men could be sent to fight in France. 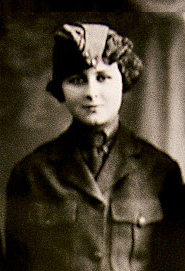 Of the 305 women selected for the reserve Marines, the very first woman to enlist on August 13 was Opha Mae Johnson. These women held their jobs until the end of the War, many of them rising through the ranks during that time. After the armistice they were all switched to inactive status, but in recognition of their service they received the same benefits as male veterans.